Hypophosphites Limes & Soda 1/2 oz. Rev. Edward A. Wilson of Williamsburg, Kings Co., N.Y. In July 1847, Dr. J. Francis Churchill of Paris and later England, read a paper to the French Academy of Medicine on Tuberculosis. He was putting together his theory on the cause for consumption, by now being called tuberculosis. In 1855, Dr. Churchill coined the “Tubercular Diathesis Theory of Tuberculosis;” a year later he published this theory in Paris as De la cause immediate et du traitement specifique de la phthisie pulmonaire et des maladies tuberculeuses. In this writing, Churchill blamed Tuberculosis (or Phthisis as it soonafter came to be known) on poor oxidation. He felt Phosphorous could work to stimulate oxidation in the lung and be turned into a “phosphatide element.” He therefore suggested the use of the hypophosphate as a tonic to improve the functionability of the lung in these people. Over the next two years, knowledge of this new theory for Tuberculosis reached North America. In 1860, it was introduced to the Physio-Medical profession by the reprinting of Dr. Richard Quinn’s London Lancet article on the same subject. This then was published by Cincinnati Medical & Surgical News, a new name for an old journal linked to the most popular form of alternative medicine in the midwest–Physiomedicine. The prior name for this journal–Physio-Medical Recorder. Churchill’s beliefs became a part of John Kennedy Bristow’s continued reading in medicine. Over the next decade, Dr. Churchill’s studies received considerable support from various groups, but by 1869 it was recommended that use of this remedy for tuberculosis be dropped. But John Kennedy Bristow took on this curing philosophy and began to promote to his patients and friends in Oregon. Howvever, once this recipe became popular to the irregular physicians, some changes had to be made. The support Churchill’s recipe received led it to be re-formulated in 1864 by Mr. W.S. Thompson of Baltimore and Professor William Proctor. They both wrote a recipe that was later published in Parrish’s Pharmacy, 3ed. (pp. 429-430). Parrish’s formula later appeared in the British Medical Journal for March 27, 1880. Another recipe appeared in New Remedies in September 1882 (p. 267). However, none of these recipes mention the inclusion of Alantin (Pura) and Meconin (Pura) as posed by Dr. Bristow in his vade mecum. Alantin is an alternative name for Inulin, a starch derived from the roots of Inula elecampane. Alantin is first used in 1854, appearing in Trommsdorf’s Journal (xviii, 1, p. 74). Inulin itself has a much older history than either Alantin or Meconin. This makes the Churchill’s recipe detailed by Bristow unique to the region for the time. The source for the recipe that included Alantin and Meconin in it has yet to be determined. Endnote: A lot of the modern over-the-counter preparation devoted to this line of thinking originated due to Churchill’s formula. The popularity of phosphates and other oxygen promoting compounds for health had consumption or tuberculosis as the reason for their creation. Modern applications for the same philosophy have since developed and been modified to deal with treating cancer and other diseases through such events as oxidation, anti-oxidation, elimination of cancer or disease causing chemicals through the use of peroxides, etc. Chronology and History notes for “Dr. 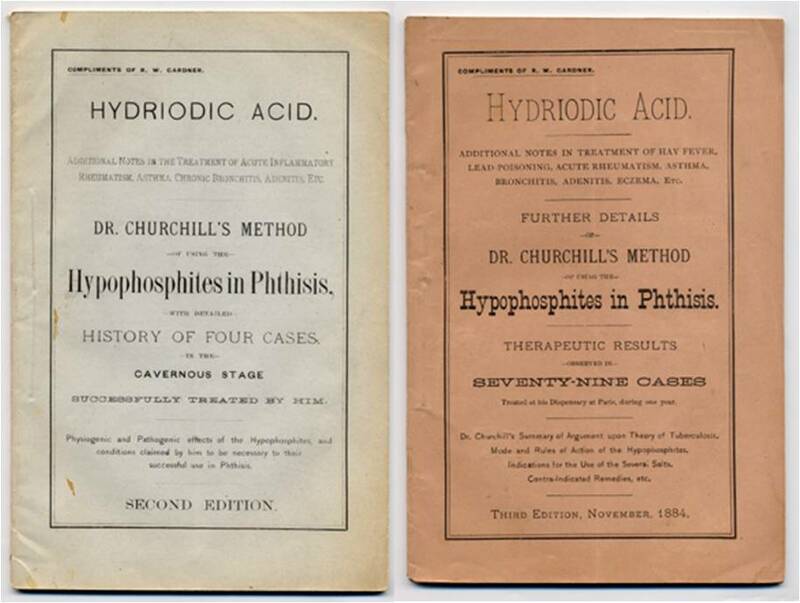 Churchill’s Cure for Consumption” and hypophosphites. 1847, July Dr. J. Francis Churchill of Paris read a paper to the French Academy of Medicine. [Ref: Quain, Richard. Cincinatti Medical & Surgical News, v. 1, p. 168-174. (June 1860). 1855 Invented by J. Francis Churchill of London, later of Paris, France. “Tubercular diathesis” Theory. 1858 Published discovery in De la cause immediate et du traitement specifique de la phthisie pulmonaire et des maladies tuberculeuses. Paris, 1858. 1858-1869 Use of the remedy is supported by various studies; some start reccomending it use for phthisis be dropped. 1860 Richard Quain’s Article in Cincinatti Medical & Surgical News. Reprinted from the London Lancet. 1864 Mr. W.S. Thompson, Baltimore & Professor William Proctor propose a formula in the first American Publication–Parrish’s Pharmacy, 3ed. pp. 429-430. British Medical Journal, Mar 27, 1880. No mention of Alantin or Meconin is made in their rendition. No mention is made in recipe given in New Remedies, Sep. 1882, p. 267. 1873 Use of Meconin is dropped from medicine according to Robley Dunglison. 1878, July Reaction given by J. Bundy in Newer Preparations, includes Berberis. see p. 1244. 1880 Frederick Churchill’s more satisfactory preparation. Victorian Hospital for Children. 1898 Boddaert’s study published show that it is primarily eliminated through the kidneys. e1900s. Use of Hypophosphite stops.